Insulated, distinctive, strong. The Double Barrel stainless steel mug from Eco Vessel will be your traveling buddy for any drink. Coffee, tea, cola, or stout all stay the way they started when you pour them into the Eco Vessel Double Barrel Beer Mug with Lid. This stainless steel mug is fashioned like a beer barrel but isn't just for carbonated hops and malt. Insulated, distinctive, strong. 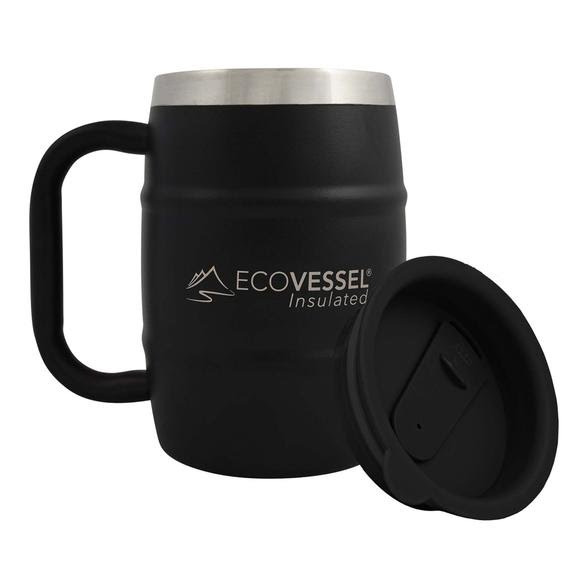 The Double Barrel stainless steel mug from Eco Vessel will be your traveling buddy for any drink. Coffee, tea, cola, or stout all stay the way they started when you pour them into the Eco Vessel Double Barrel Beer Mug with Lid. This stainless steel mug is fashioned like a beer barrel but isn&apos;t just for carbonated hops and malt. Hot coffee stays hot and cold suds stay cold, and you won&apos;t wear either with the open/close slider lid.